Have fun while giving back!! 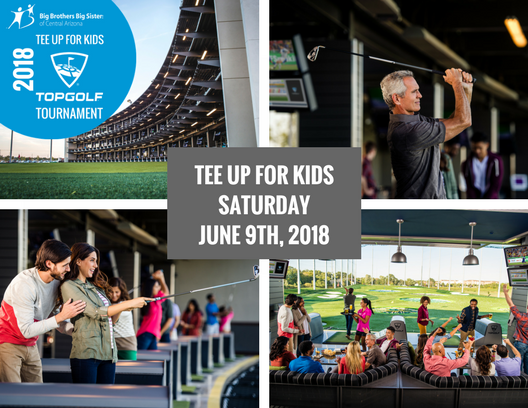 Tee Up for Kids TopGolf Tournament is one of Big Brothers Big Sisters of Central Arizona’s largest events and a fun and easy way to positively impact a child’s life. This event will bring together friends, families, and co-workers golf together to support the proven power of one-to-one mentoring! Register a team or fundraise individually and we will pair you with 5 awesome individuals. Each participant is asked to fundraise a minimum of $250. Celebrate by coming out to play golf for 3 hours, enjoy a rise and shine breakfast, a drink ticket, and prizes. Please contact Eric Barr – ebarr@bbbsaz.org if you are interested in becoming a Sponsor. Please contact Taylor Ralston – tralston@bbbsaz.org with any registration questions.